What Happens If You Try To Watch The Eclipse Without Special Glasses? Nothing Good. If your eyes are damaged, your vision will at least be blurry and you may see dark or yellow spots. If it's significant damage, you may not be able to see out of the center of your eye - only your peripheral vision. Even during August's solar eclipse, you cannot look directly at the sun without protective eye wear. We all know not to stare at the sun, right? Seems like common sense, but every time an eclipse comes around, a few people invariably try to watch it without special, protective eyewear and end up damaging their eyeballs. Even during August's solar eclipse, when the moon will travel across the sun and block part of the sunlight, you cannot look directly at the sun without very strong protective eye wear. Not just sunglasses - lenses that were designed specifically to filter out enough of the light that it doesn't burn a hole through your retinas. If you did try to look at it without your glasses, it would be "like a magnifying glass on a leaf when you were a kid," an optometrist tweeted at me. I'm not trying to provoke panic about watching the solar eclipse. Hundreds of thousands - perhaps millions - of people across the U.S. are going to walk outside Aug. 21, look up, and see something truly spectacular. That's something I look forward to. But because I'm curious (and quite a few people have asked), I thought it would be interesting to talk about what would happen if you tried to look at the sun during the eclipse. And don't tell me it doesn't happen and people know better. That's not true. According to an expert answer on the University of California ScienceLine, " . 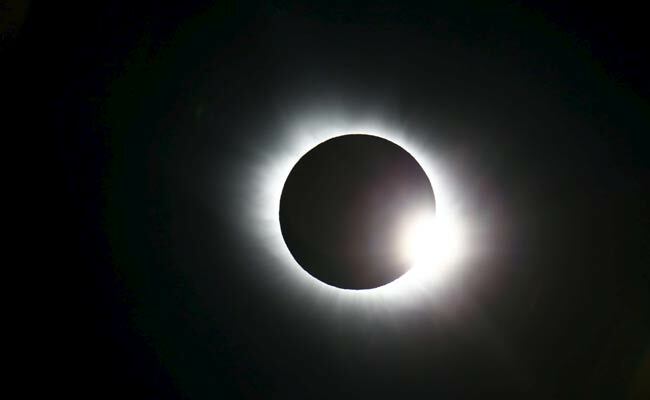 . . doctors collect information after events like the 1999 solar eclipse, when people who stared directly at the sun for several minutes went to see their doctor. In one study, about half had permanent damage." An assessment after the same eclipse in the U.K. found fewer cases than they had feared, but 14 people still managed to damage their eyes by staring at the eclipse. There's even a tale that Isaac Newton stared at the sun with one eye (for the sake of science, of course), and afterward he could only see reds and blues. I have no idea if that is fiction or fact, but it sure makes a good story. Want to watch the eclipse safely? Here's how it will go . . . It will start as a partial eclipse as the moon begins to cover the sun. Keep your glasses on at this point. When the sun is totally blocked by the moon, you can take your glasses off! Enjoy. It's beautiful. Once sunlight starts to appear again, as the moon departs, put your glasses back on and enjoy the partial eclipse. You'll only be seeing a partial eclipse. There will be harmful sun rays for the duration of the event. Keep your eclipse glasses on through the whole thing. Yes, you will go blind if you manage to endure the pain and stare at the sun for long enough. The pain from the visible part of the light spectrum could be extreme, but ultraviolet light - which we can't see - is what actually ruins the eye. It literally gives your eye a sunburn. The reason a few people always end up going blind during an eclipse is that in the partial phase, the visible light is reduced enough that it's no longer painful to look at, and so people assume it's safe. But there's still plenty of UV, and that blinds them. Depending on the sky conditions, it only takes about a minute and a half for your eyes to be permanently damaged, and the damage is cumulative, meaning you don't have to stare at the sun without looking away for it to be harmful - you may just be taking quick glances, but it's still damaging your eye. Other things you should be aware of: Some drugs dilate your pupils, which will decrease the amount of time it will take to burn the eye. People taking these drugs should always take care to wear UV-blocking sunglasses. Also, looking through a camera lens or a telescope will not protect your eyes. The latter is blatantly obvious in the video. Unless it has a filter on it that is made specifically for blocking out the harmful rays, you should not look through any lenses.